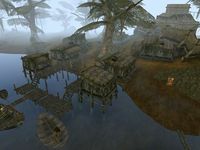 Like Hla Oad, Gnaar Mok is a financially deprived fishing village on the Bitter Coast. There is very little reason to visit Gnaar Mok during any major quest-lines, and it is only useful otherwise as a resting point while hunting, as there are few services. Druegh-jigger's Rest houses members of the Thieves Guild. Wadarkhu is a Master Trainer in Sneak. Nadene Rotheran's Shack holds the local contingent of Camonna Tong thugs. They may not like you, but do offer some services and training. A minor Hlaalu noble, Almse Arenim, owns a manor just north of town. There is some training and savant services available. A small boat at the harbor can take you south to Hla Oad and north to Khuul. Dirt trails go north to Gnisis and south to Hla Oad. The road east to Caldera and Ald'ruhn is difficult at first. People are worried about some Breeding Netch north of town, and you can raise their disposition if you take care of the problem. 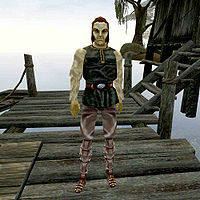 There is a Dwemer ruin (Aleft) and some Daedric ruins to the south. The famous (for Orcs) and the largely unimportant (unless you do the quest regarding it) Khartag Point is to the north with the Dunmer Stronghold of Andasreth just beyond. 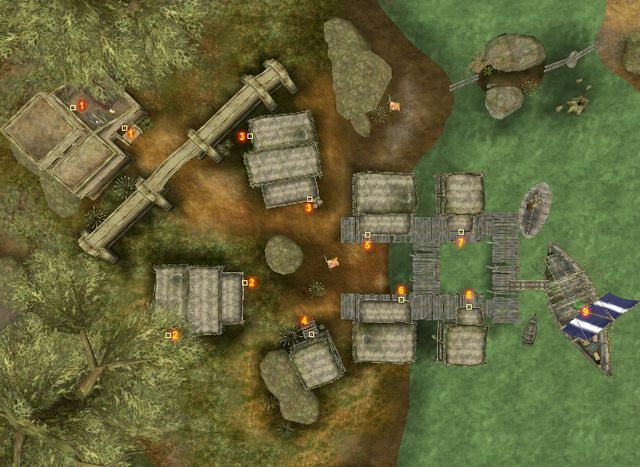 The Sixth House base of Ilunibi is on a tiny islet north of town, reached by a series of planks.